Under Captain Arjen van der Veen, the engineless 32-meter schooner brig Tres Hombres is arriving now in La Palma, Canary Islands. This is her sixth annual voyage across the Atlantic and back to Europe, carrying intensely desirable cargoes for discerning eco-savvy customers. 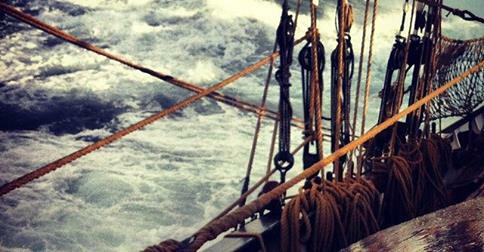 The tall ship started her voyage from her home port of Den Helder on Oct. 9. 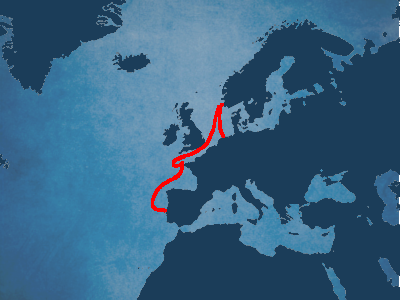 She first sailed to Stavanger, Norway to pick up a load of salt fish. 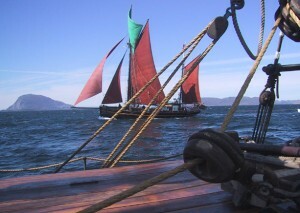 From there she sailed to Brixham, UK, where she took on ale. Foul weather did not slow the ride; it made it faster. The next stop was Douarnenez, Brittany, to unload ale in exchange for fine French wine. 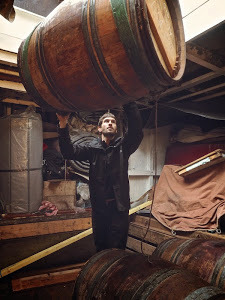 The wine will circulate back and forth across the Atlantic in order to give it the unique, accelerated aging effect of the sea's natural, rocking motion. Château le Puy is the wine, biodynamic red produced since 1610 from Bordeaux. Eight barrels are now in the Tres Hombres cargo bay. The ship did not start the voyage empty: gymnastic equipment was loaded for recipients in Cabo Verde and Belem, Brazil, as a donation from a Dutch artist. Spices will be picked up in Belem. 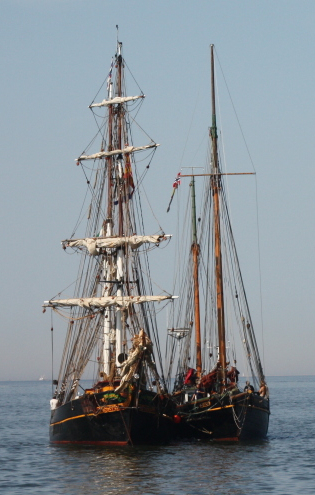 To double Fair Transport's capacity next season, the Tres Hombres will sail to the Caribbean twice. This will be henceforth, made possible as their second ship, the Nordlys, will be ready to take over the coastal work that the Tres Hombres has always done between transatlantic trips. The engineless Nordlys will come on line in April. With no engine, these ships can fulfill truly zero carbon transport, which would probably be significantly petroleum-powered if there were auxiliary engines available to use with the best intentions. This makes the issue of labeling or certification easier than trying to determine how much a sailing ship ran its engine. Such as, is a free-range chicken allowed out of its tiny cage for just a moment, or does it live outside as much as it wishes? No cages solves it. 9 days of sail was again a great experience for crew and trainees. We had wind and no wind, waves and no waves, sun and rain, incredible clouds and clear skies. Great food, people and ship! That is life on board the Tres Hombres. Before this repeat epic voyage, the Tres Hombres got a new jib boom as part of the annual refit. 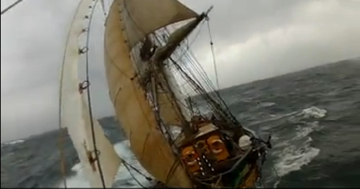 The strain on the rigging in a storm, or by an error at the helm, can cause a disaster resulting in loss of life. But the crews have been uniformly first rate, since the first voyage of the new ship in 2009 for its maiden voyage from Den Helder, Netherlands to Copenhagen for the U.N. climate change conference. We left Setubal at 1300 on Thursday and picked up a South wind. Just enough to make a West course! Our plan was to sail west till we hit the North West winds behind this low pressure system we were sailing into. And that what exactly happened! A sudden wind shift after and than there was no wind for 2 hours. Just waves and heavy rain. Welcome back at sea! This morning with the rising sun we already made a good 45 miles South. The wind prediction says North winds all the way to the Canaries. 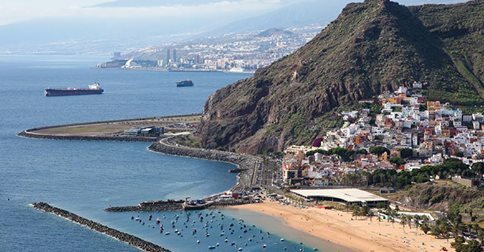 In the Canaries Tres Hombres picks up five barrels of local rum. More rum will be taken on in the Dominican Republic -- for our favorite brand rum, the only sail-transported stuff: Tres Hombres Rum. Also in the Dominican Republic 5,000 kilos of organic coffee will be loaded. This is up from 1,000 kilos from the last voyage. Fair Transport has its own roaster in The Netherlands. You're a tea person instead? 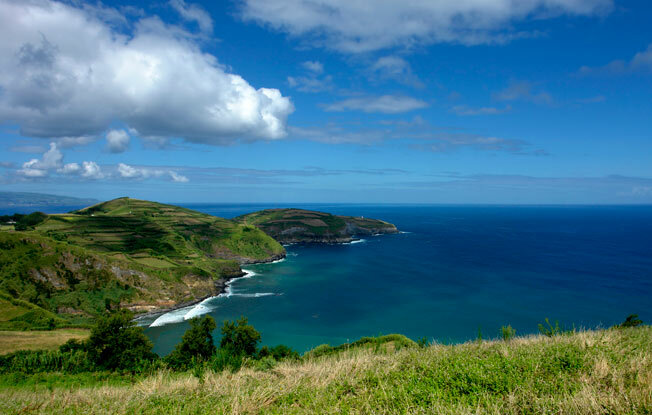 The Tres Hombres will once again pick up tea grown on the Azores islands! Chocolate bars will be taken on in Grenada, and cacao beans in the Dominican Republic. The European stops before the ship comes home in June will be Ireland,the U.K, and Belgium. Cape Finisterre (Galician: Cabo Fisterra) is a rock-bound peninsula on the west coast of Galicia, Spain [pictured here]. 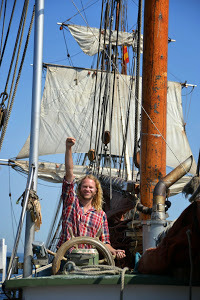 The crew of the Tres Hombres saw Finisterre en route, and in future so will the Nordlys' crew. Nearing the tropics just a matter of days ago, the Tres Hombres's log said, "The sailing is great, the moving landscape of high swell and waves fascinating and the temperature pleasantly rising: we have the Sahara on portside." This update helps the public understand just what Tres Hombres and its operator, Fair Transport Shipping & Trading, is accomplishing and where the organization is headed. The joyous details on the current voyage are not completely set out here for lack of space. News details to come: Fair Transport is now pursuing the construction of its biggest ship, a clipper, and is thinking about a voyage of the Nordlys in 2016 to the Mediterranean with salt fish. SAIL MED will be on hand. The Ecoliner, a high-tech cargo ship-design, is nearing its study-completion under a European Union grant. Promotion has been stepped up with the private sector. Originally envisioned by Fair Transport and Dykstra Naval Architechts, the Ecoliner project of the SAIL consortium is entering its last phase of design and business/regulatory planning. An investor's participation is in the wings. At SAIL's November meeting in Malmö, Sweden, this reporter once again participated and helped represent Fair Transport . Although there have been myriad ins-and-outs and questions to quantify, for such an unprecedented undertaking as a 22-million-Euro Ecoliner, I did not encounter argument when I asserted, "Build it and they will come." 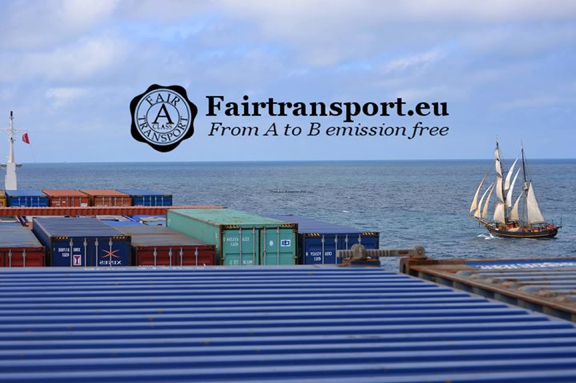 The beauty of Fair Transport's projects and the strong support the Dutch company enjoys raises the question, why is there not more such sailing of cargo? Is climate protection not yet important enough to start making a big dent in the 80,000-odd oil-burning vessels stoking the fires of the global corporate economy? Just 16 (sixteen) of the biggest cargo ships spew as much sulfur and other pollutants as all the world's cars. Is peak oil of no consequence for anyone doing any planning? Conventional, easy-to-extract, high-net-energy oil reached its historic maximum supply in 2005. Do people who love organic chocolate and coffee not demand carbon-emission-free products, to protect Earth's climate and lessen vulnerability to oil supply shocks? Yes, but not many, although our numbers are rising. As sail transport makes inroads and the world wants more of it -- rediscovering the not-so-distant past -- a major benefit will be the localization of economies. Although linking the world is sail power's historic claim to fame, the days are numbered for the globalized corporate economy of excess consumption: it runs on petroleum and has played a big role in making this new century host to 14 out of 15 of the hottest years on record. So cut the engine and hoist sails! Ready the bike-carts and horse-carts at the docks! All photos courtesy Fair Transport and its friends.